It was no doubt the high yields and growing demand for grain that encouraged the Canadian Pacific Railway to extend a branch line from Marsden, Saskatchewan through to Paradise Valley in 1929. The track was built through to LSD 13 of NW6 TP47 R2 W4, where the CPR subdivided a townsite and erected a small station. The post office was brought in and a community called Paradise Valley quickly evolved, although it was never large and would not be incorporated as a village until 1964. The district was prosperous however, and the farmers were happy not to have to haul their farm produce all the way to Kitscoty, for, almost immediately after the railway arrived, several grain elevators dotted the skyline. These were owned by the United Grain Growers, Searle, the western Grain Company, and the Alberta Wheat Pool. In time, these elevators were joined by structures owned by the McCabe Brothers and the Federal Grain Company. That one of the first elevators would have been an Alberta Wheat Pool structure is not surprising, for, by this time, the Pool had become the predominant grain company in Alberta. It was a farmers’ owned company begun six years earlier under the direction of Henry Wise Wood of the United Farmers of Alberta. The Alberta Wheat Pool was a co-operative in the sense that all members agreed to pool their earnings to gain steady and assured profits. The profits were also marginally greater than normal as no entrepreneurial interests stood between the farmers and the international markets. This collective approach also allowed the farmers to withstand periods of low prices by holding back grain for sale until prices were higher. 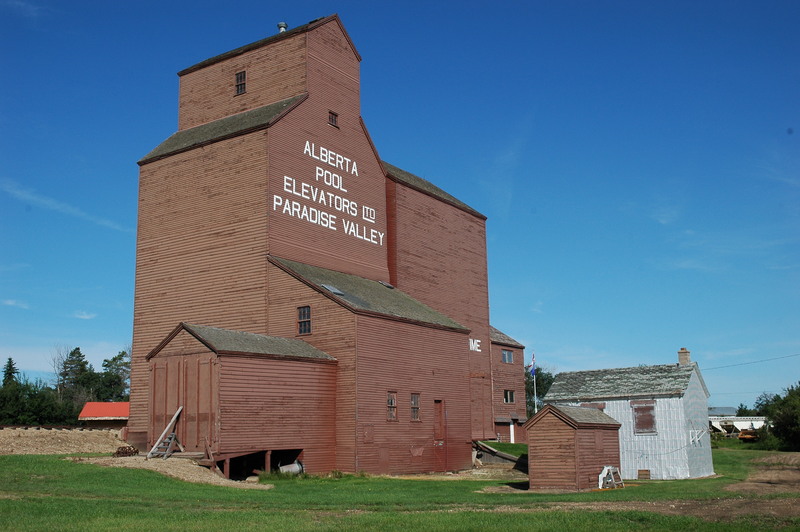 The Alberta Wheat Pool elevator in Paradise Valley continued to serve the district throughout the Great Depression, when prices dropped to as low as $0.32 per bushel for #1 wheat. Prosperity returned with the coming of World War II and the war’s immediate aftermath. In 1962, the Wheat Pool elevator was accompanied by a large crib annex. Also, as so many district farmers were Pool members, the Pool gradually purchased the other elevators in the village until, by 1980, the Pool owned all five of them. Not long afterwards however, the Pool took a course leading to the building of larger district elevators, and the Pool elevators in Paradise Valley began to be dismantled. Farmers were soon made to take their grain north to Kitscoty, which became easier with the paving of Highway #897. The original Pool elevator was left standing however and was turned over to the Paradise Valley & District Museum Society. In 2008 it became a provincial historic resource, as did the nearby 1929 CPR railway station. Read the Statements of Signicance for both these sites by visiting the Alberta Register of Historic Places (search: Paradise Valley).